Kwik-Fit has agreed an exclusive arrangement with Michelin Tyres to offer customers a free accidental tyre damage guarantee. This offers total protection against suffering an unexpected puncture - whether it's from colliding with a pothole, hitting a kerb or running over road debris. Last year, nine million motorists spent a total £570 million on repairing damaged tyres. New research from Kwik Fit reveals that 8.8 million (26%) motorists suffered a puncture in the past 12 months, costing motorists a staggering £570 million. Its study shows that motorists who suffered a puncture from potholes and speed bumps rose from 1.5 million in 2009 to 3.8 million in the last 12 months. Motorists who suffered a puncture reported that in the majority of cases (61%), damage was so extensive that their tyres could not be repaired and the average cost of a replacement tyre was £65. 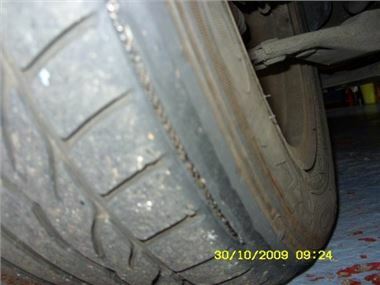 Another significant cause to replace otherwise perfectly good tyres is impact damage where the force of collision against a kerb, or even a deep pothole, is so intense that the structural integrity of the tyre can rupture, causing bulges, and alloy or steel wheels can get bent out of shape. Unlike punctures, bulges can go unnoticed, usually leading to sudden deflation - commonly known as a "blowout". In order to provide Britain's hard pressed motorists with peace of mind, Kwik-Fit has agreed an exclusive arrangement with Michelin Tyres to offer customers a free accidental tyre damage guarantee. This offers total protection against suffering an unexpected puncture - whether it's from colliding with a pothole, hitting a kerb or running over road debris. The guarantee provides free puncture repair, valve, rebalancing and nitrogen fills for the legal life of the tyre and if a puncture can't be repaired a replacement tyre will be offered. Ian Fraser, Kwik Fit chief executive said: "Cars may have improved in quality over the years but the same cannot be said for our road surfaces, which in places resemble an obstacle course for motorists. Britain's road network has borne the brunt of two harsh winters and the explosion in potholes has piled on the misery for motorists already reeling from recent fuel hikes." "As well as deteriorating roads, driving over speed bumps has also contributed to a large number of damaged tyres." "By teaming up with Michelin to offer an accidental tyre damage guarantee, motorists can take to the road safe in the knowledge that a blow-out won't end up deflating their wallet too." Conditions: Kwik Fit will inspect and assess the tyre, but will replace the tyre if it is considered a repair cannot be carried out safely. This offer applies to any Michelin tyre bought from Kwik-Fit from May 1st until May 28th 2011. Guarantee lasts for 12 months. A free replacement tyre will be offered if the original tyre is less than 3 months old; 75% off the price of a new tyre if the original tyre is 3-6 months old; 50% off if it's 6-9 months old; and 25% off if it's 9-12 months old.